Getting stuff done is only part of the problem. To be productive, you need to get the right stuff done. The concept of “right” only makes sense against what you want to achieve. This is where goal setting comes in. When you have (some) clarity on your goals you can start to plan how to achieve them. At this point people start thinking about time management – a phrase I have never liked. We can’t control time so how do we manage it? We can manage what we do with time, and hopefully, we allocate our time according to our goals and priorities. At some point on this journey, you might be tempted to get more done by multi-tasking. Don’t. Multitasking does not work. My current tool of choice for helping me deliver against my priorities is my journal. I can set daily, weekly and monthly goals/targets and use them to help guide me on what I do. When I get overwhelmed I can review my daily priorities and recentre myself. Breaking down what I want to achieve in a month into weekly and daily tasks helps make goals more achievable. A journal is a flexible tool that can handle any sort of task. Timeboxing is a great way to break up tasks that could stretch on for ages but are not impacted if you stop part way through. When I was in full-time education I studied using time-boxing. It’s easier to schedule 4-time chinks this afternoon on database theory than it is to schedule completing the relational algebra module revision. This is also a great technique for overcoming procrastination on undesirable tasks. Weeding the garden is a never-ending task but 20 minutes and then a cuppa is manageable. Some tasks follow predictable steps and it can be helpful to visualise where in the workflow different jobs are. My blog posts start life as an idea. They get expanded out into a mind map. Then I draft a post. Next is quality checking, adding links and images. Finally, it is published or scheduled for publishing. Such a workflow can be expressed on a personal kanban board which helps to visualise where each job (blog post) is at in the production system. If you are not ready to implement a personal productivity system, you could get tactical with a simple tool. If you have set goals you can assess how well the tasks you could do contribute to your goals. This will help you chose more impactful tasks to work on. Or you can steel a tool from a former president and consider the urgency and importance of the potential tasks. There are many tasks that are too big to do in one go and you can’t arbitrarily break them up. For these tasks, you need to breaking down big tasksbreak them down into smaller tasks. Things do not always go as we would like. We may have to manage distractions in an office and implement strategies to help you focus. There may be days when we are not at our best but we still need to get stuff done. You might have to prioritize getting better sleep to make you more effective. You might be following a system and yet still find you are not getting done the things you want to achieve. In this instance, I’d recommend tracking your time for a week to see where your time is doing. If you are spending all your time on activities that do not align to your priorities then you need to start working on different tasks. 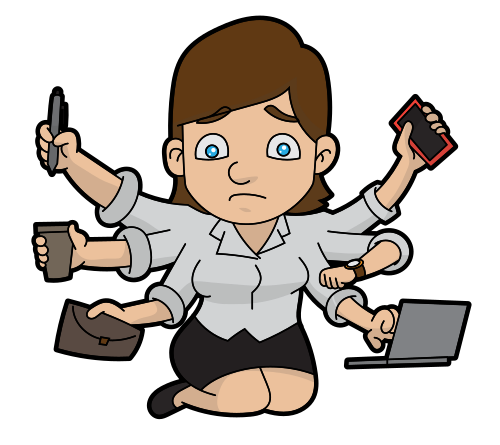 If you are drowning in necessary but low-value admin then it might be worth considering a virtual assistant. All of this might make you think that it’s important to be always on, always productive. That’s not the case. If all of this makes you think I am a productivty ninja – let me assure this is certainly not the case.